Weight loss is the primary outcome following bariatric surgery; however, its documentation within current literature is heterogeneous and poorly defined, limiting meaningful comparison between studies. Randomized controlled trials from 2012 to 2016 were identified using the Medline database through “Gastric bypass OR sleeve gastrectomy AND weight” search terms. A total of 73 studies with 5948 patients were included. Reporting of preoperative weight was done primarily using mean body mass index (BMI) (87.7%) and mean weight (65.8%). 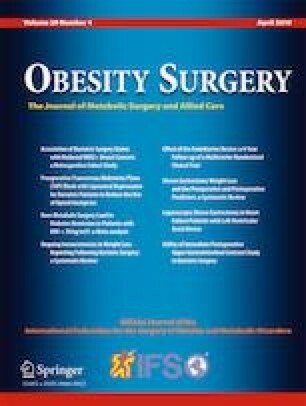 Postoperative weight reporting was more variable, with the most frequently reported measure being mean postoperative BMI (71.2%). Overall, nearly one third of all bariatric literature contained discrepancies that precluded meaningful meta-analysis. Reporting of weight loss following bariatric surgery is becoming increasingly diverse for both pre- and post-operative outcomes. Ongoing heterogeneity will continue to act as a barrier to meaningful comparison of bariatric outcomes until standardized reporting practices become adopted. Centre for the Advancement of Minimally Invasive Surgery (CAMIS). Authors 1, 2, 3, 4, 5, and 6: None to declare. Author 7 is a consultant and has received educational grants from Ethicon and Covidien, educational grants from Stryker, and teaching honoraria from Cook Surgery and Bard Davol. Author 8 is a consultant for Gore Medical and Ethicon. This article does not contain any studies with human participants or animals performed by any of the authors. For this type of study, formal consent is not required. Informed consent does not apply.